With the Gold Medals heading their way across the Atlantic to America, it is clear that the US side were the big winners at the 2014 FIBA World Cup, but it is not as if they are the only winners at the event in Spain. Given that many bookmakers were offering odds on teams going furthest when you exclude USA and Spain, the fact that Spain didn’t make it to the semi-finals is something to be regarded as a highlight, unless you were a local fan in the host nation. Not many people tipped Serbia to finish in the medal placing so while they suffered a disappointing loss in the final the fact that they grabbed the Silver Medal for their efforts in Spain is a great reward. France, due to the fact that they knocked out host nation Spain, were deserving of the Bronze Medal that they picked up on Saturday, winning against Lithuania. While he enjoyed the Gold Medal he received after the end of the final, Kyrie Irving can take a great deal of happiness in the MVP award. It is always best to ensure the team wins but if you can receive a team Gold and a personal award, you know that you have done quite well for yourself over a tournament. There were plenty of great players on show for Team USA but they seemed to take it in turns to deliver a good performance. Thanks to the consistency he showed. Irving was a well-received choice for the MVP award. There was another big winner who were acknowledged on Sunday in Spain. It had been the first Philippines performance at the FIBA World Cup in 36 years, and the team managed to grab their first win at the tournament in 40 years. Their fans brought a lot of colour, noise and energy to the tournament and these fans were rewarded with the Most Valuable Fan Best Country award. During the half time of the final between USA and Serbia, a video montage of the fans was played out, with many in the stadium applauding and cheering these fans. There is no doubt that a plucky attitude and optimism can sometimes be used and abused by the media and franchise owners in the sporting world, but at the World Cup, there was a great deal of adulation offered to the Philippines fans. 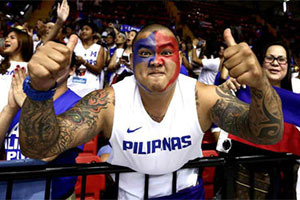 They backed their team to the hilt and the win against Senegal will be long remembered by basketball fans in the Philippines. The team also went toe to toe with Croatia, Puerto Rico and Argentina, with the game against Greece being the only match where they fell away from their rival. When you consider the long, long odds that were provided to the Philippines by the bookmakers, the fact that the nation managed to hang in there for that long is definitely something to be acknowledged as a positive thing. The Philippines fans made sure their voices and songs were heard in the Palacio Municipal de Deportes in Seville, helping to pack out the arena which has a capacity of just over 7,000 people. The FIBA Basketball World Cup may be over once again, and it won’t be back with us until 2019 as the tournament is altering its cycle to avoid clashing with the FIFA World Cup, but there are plenty of major basketball events to look forward to in the summers leading up to the next major FIBA event.